If you're hoping to increase your home's value (above and beyond the cost of an upgrade itself), you should know that the upgrades you value might not be valuable to potential buyers. In fact, you may never recoup the full cost of some home improvements, and the primary offenders might surprise you! 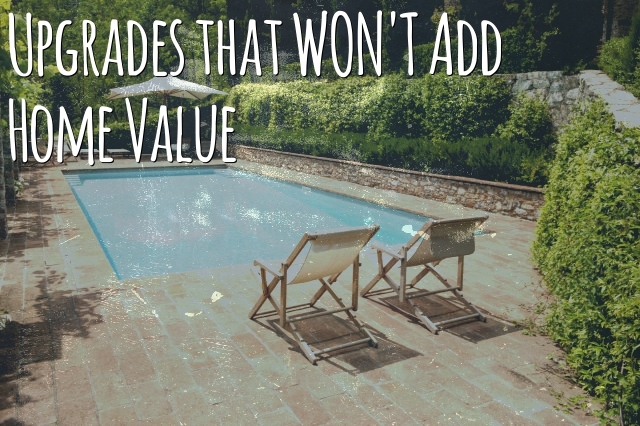 Pools can be hit-or-miss when it comes to added value. If you're selling Orlando, FL, real estate, or you live in a warm climate where people are inclined to use a pool year-round, you're more likely to get a favorable response from buyers. Often, however, the return is not enough to pay for the pool itself. Don't forget that you'll need to operate and maintain the pool, and this comes with a sizable extra cost. Ultimately, your likelihood of recouping the money you spent on maintenance, in addition to the installation costs, is pretty low. Plus, adding a pool to your home could be a major turnoff to some buyers. Buyers with small children may be concerned about safety risks, those looking for a low-maintenance yard won't want to deal with the hassle and upkeep of cleaning a pool, and buyers who are on a tight budget may not have the extra cash to deal with the added expense. Your idea of a dream kitchen probably isn't everyone's idea of a dream kitchen. Unless you plan to stay in your house for many years to come, think twice about renovations that are too personalized. If you install a kitchen backsplash, you might recoup the cost, because the difference between "no backsplash" and "backsplash" is noticeable. But the specific type of tile might not matter to buyers — they could be just as happy with a simple ceramic tile as they would with an expensive Calacatta marble tile. Similarly, choosing a beveled countertop edge that's complex and ornate, rather than a basic beveled edge, can turn off buyers whose tastes don't align with yours. In fact, these custom features may wind up costing you come listing time, as many buyers will factor in the money they'll need to spend to change the house to suit their own tastes. If you're going to upgrade your kitchen just for the sake of selling, stick with neutral, builder-grade design decisions. You might not need that extra room and dream of knocking down a wall to create a giant walk-in closet. Or perhaps you'd prefer to cover the walls with soundproof foam and convert it into a recording studio. Unfortunately, most buyers won't share your interests. Instead, they prefer an extra bedroom for children or guests. Sizable square footage gains — like finishing your dingy basement so it becomes an additional livable floor — can be a boon in buyers' minds. But tiny, incremental changes may not give you much of a return on your investment. You may love your new sunroom, but it's not likely to drastically increase your home's overall value. Adding square footage in a way that doesn't flow well with the floor plan can also backfire. Sure, a half bath on the first floor would be useful, but if buyers have to pass through the kitchen to get to it, the half bath loses some of its appeal. No one wants to buy a mega-mansion on a block full of split-levels. When your upgrades feel overboard for your neighborhood, you alienate buyers on two fronts: Buyers who are drawn to your neighborhood won't be able to afford your home, and buyers who can afford a home of your caliber will prefer to be in a ritzier area. Keep the "base level" of your neighborhood in mind. Tour some open houses on your block to see how your neighbors' kitchens look before you invest a small fortune in granite countertops and high-end fixtures. Being a little nicer than the other houses around you can be a selling point, but being vastly more luxurious is not. Pursue these home upgrades for your own enjoyment — but don't trick yourself into believing you'll more than recoup the cost of the improvement in the form of a much larger listing price when it comes time to sell. You can always opt for the projects that have the best potential to draw in a buyer instead!